I simply cannot believe you guys are obfuscating the unsubscribe options from your emails. This is a violation of MailChimp‘s terms of service, which I am sure you already know. White text on a white background is a deceptive way of hiding the unsubscribe option as well as your physical address. This is a violation of the CAN-SPAM Act. I recommend whoever is running your email marketing read up on the FTC‘s rules. I’ll be as kind as to provide a quick link. I’ll even provide a screenshot of what I was sent so you can see the issue at hand. I would not have unsubscribed, or blogged this situation, had you guys followed the rules. I’ve also informed MailChimp following instructions on their abuse page. This entry was posted in Life, Rant and tagged Can Spam Act, CAN-SPAM Act of 2003, email marketing, FTC, Inside Columbia Magazine, MailChimp, opt-in rules, opt-out, spammer by Justin Scott. Bookmark the permalink. @justex07 great post,couldn’t agree more! In general I think they don’t have a clue what they are doing involving marketing & social media! @iNorio it really ticked me off. I was surprised @MailChimp didn’t catch it first, they are very strict about following the law. @willettjf thanks for sharing the link. Hopefully it will get someone there to change their flawed spam policies. @justex07 @MailChimp Justin, what is your email address? We will unsubscribe you. 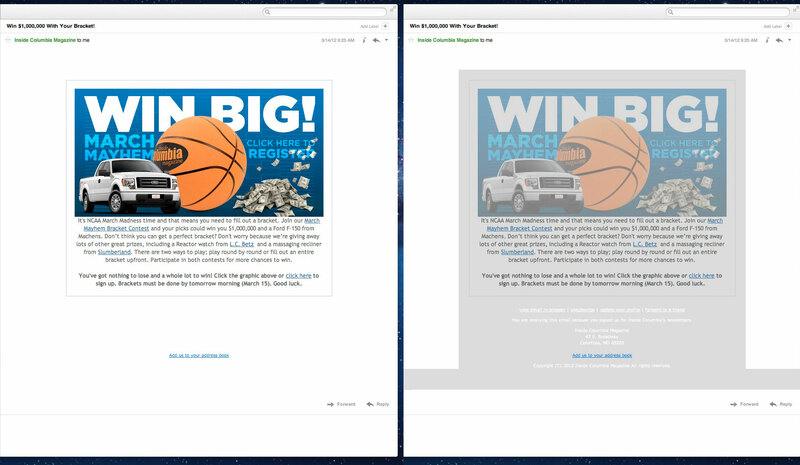 @Inside_Columbia @MailChimp I have already unsubscribed, as explained in my email to Haley and the blog post I linked to.